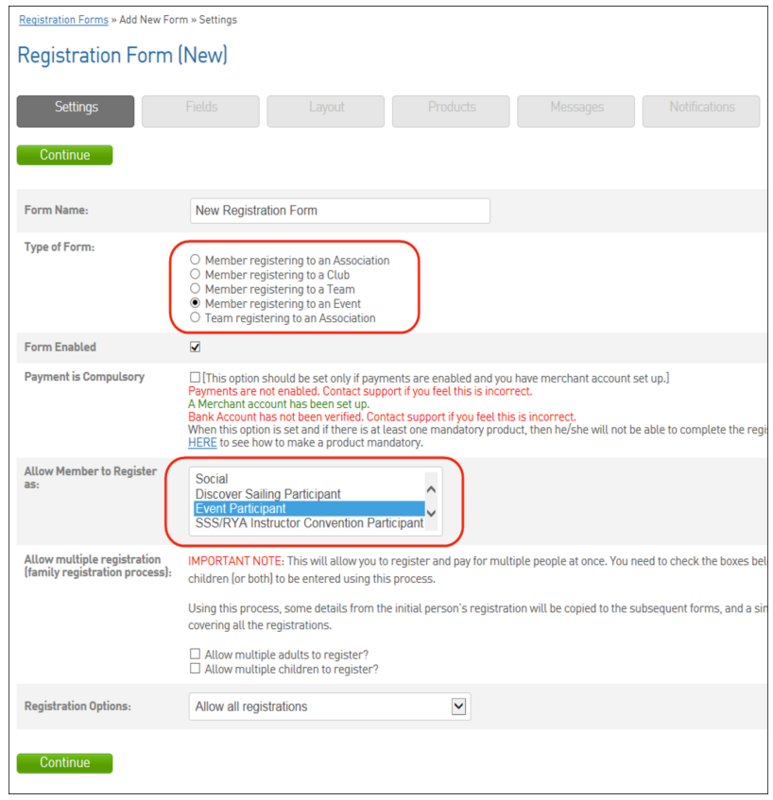 To create a Member to Event Registration Form, please follow these simple steps. 1. From your dashboard, hover over Registrations and click 'Registration Forms'. 2. From the Registration Forms page click 'Add New Form'. 3. In the Settings tab, ensure you choose the correct 'Type of Form' - Member registering to an Event and the correct 'Allow Member to Register as' which corresponds to the Event, i.e. Discover Sailing Participant, Event Participant, etc. You can also choose to 'Allow multiple registration (family registration process)' in the Settings tab. This will allow you to register and pay for multiple people at once. Using this process, some details from the initial person's registration will be copied to the subsequent forms, and a single payment will be made covering all the registrations. 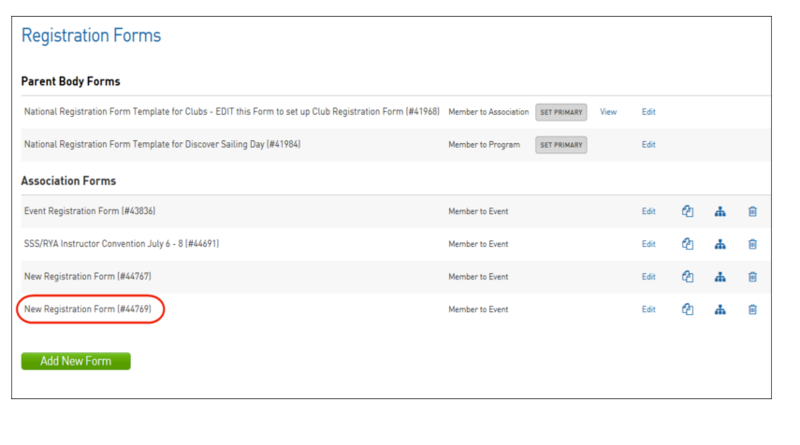 Click on continue to get to the next tab and follow the prompts to edit your Event Registration Form. 4. The Fields tab allows you to choose the visibility and editing options for each of the available Member fields. Use the slider on the right to scroll through the options. Once you have defined the options for the Member fields click on Continue to get to the Layout tab. 5. 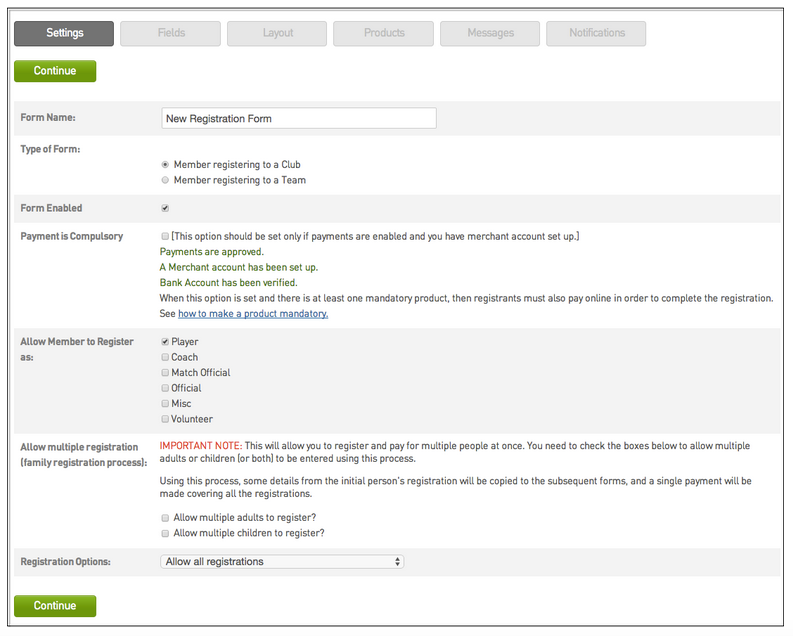 The Layout tab allows you to reorder the registration form fields. Click on the field you would like to move, hold the mouse button and drag the field to the new position. The new order is saved automatically. 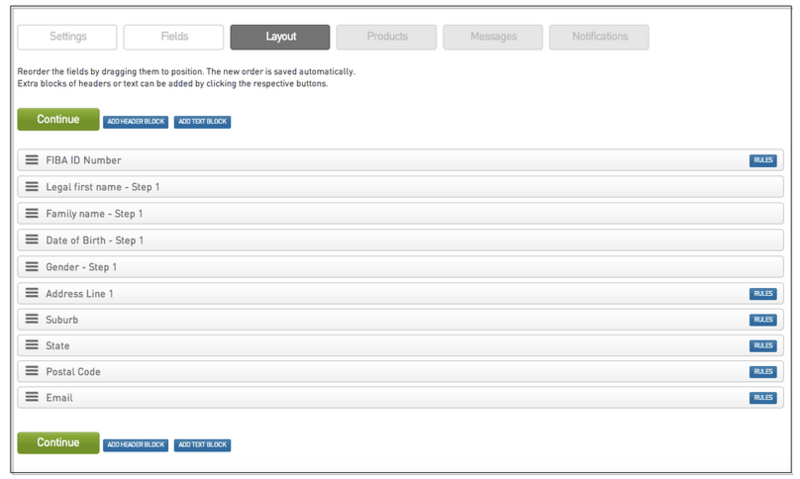 Extra blocks of headers or text can be added by clicking the respective buttons. When you are satisfied with the order of the fields, click on Continue to access the Products tab. 6. Products tab: Choose which products to make available for selection on the registration form by checking the corresponding 'Active' box. Check the 'Mandatory' box to make the product mandatory on the registration form. Sequence dictates the order in which the product will display within its group on the registration form. Click on Continue to get to the Messages tab. 7. 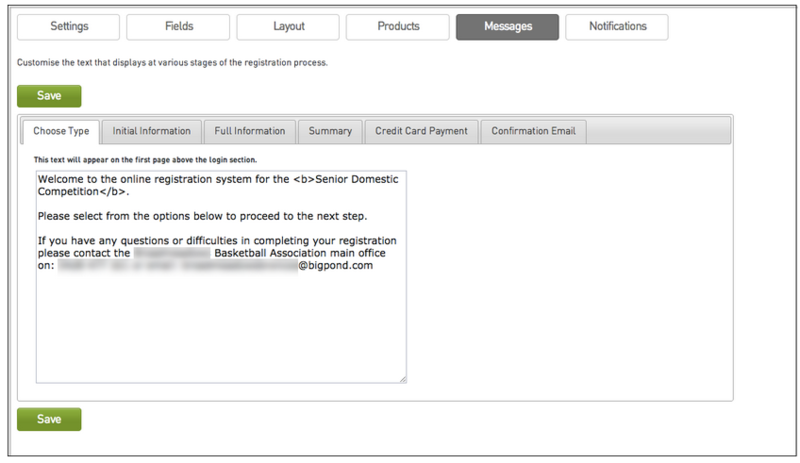 The Messages tab allows you to customise the text that displays at various stages of the registration process. Click on Continue to get to the Notifications tab. 8. Notifications tab: Choose who should receive emails emanating the registration process. Click on Continue to complete the Registration Form Setup. 9. The new Registration Form will be displayed in the Registration Forms list.